.....about 13.5 pound of'em. Apple/hickory blend smoked for 4 hours. Finishing in the oven right now. I'll be chewing on a couple of these tonight. Damn Tom, those things look amazing!!!!!!!! I can almost smell the picture! I’d fish them. Try to e-core them bad boys with some cheese! Try to e-core them bad boys with some cheese! Don't get me thinking. They are tasty though. I tried my hand at these for the first time several months ago. Cantankerous little rascals to get just right. They can be something else that's for sure. Split casing is the biggest issue. I find that if I add a bit of [bottled] water to the meat after the seasonings and meat go thru the first grind things go better. I have a tower stuffer though and that is a big help, much better than stuffing off the grinder. Those jerky cannons can be used to stuff sticks too but they're no better than grinder stuffing in my opinion. My stuffer is a 5 pound. I picked up a stainless 3/8" nozzle for the sticks and I use the smoked 19mm edible collagen casings. The casings are a little tougher than clear casing or casing for fresh sausage and won't rupture very easy. Since the stuffing aspect is generally slow going I only do small batches of the sticks. It took about 35 minutes to stuff the 13 pounds of seasoned meat I had. The sticks are the most costly sausage to make too when one considers the cost of the casing vs pounds of sausage rendered. 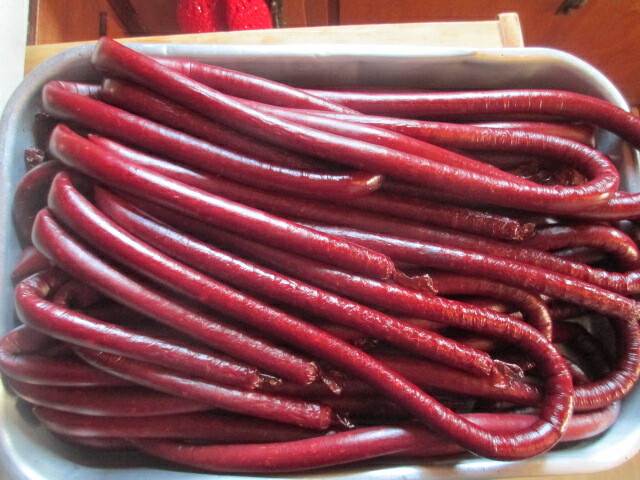 I can stuff 25 pounds of summer sausage in about 20 minutes and the casings will cost about $12.00. 25 pounds of sticks would take well over an hour to stuff and cost over $30.00 for the casings. BUT, the sticks are one very tasty treat, so they're worth the extra cost and fuss. Yum I can taste them from hear. Those look GREAT. I've thought about trying to make some but have never tried. They're really not that hard to make but a guy does have to slow down or he'll be blowing casings. And be sure you are using the 19mm "smoked" casings.....they're the toughest casings and made for making sticks. If you haven't ever done them before and have access to a handle cannon type extruder used to make jerky from ground meat, use it. Stuffing off a grinder can be a real challenge unless you have a foot control to start/stop instantly. Another tip is that most people over-smoke them. They're thin and three hours of smoke is about all one needs to put on them to have a great snack stick. And being this they can be over cooked and dry pretty easy so watch how long you have heat on them. A regular smoker will do a batch in around five hours.....three hours with smoke and the final two just heat. Let them hang a day before cutting to size for freezing. I've been enjoying a stick or two of whole muscle jerky every day for a while but just put a bag of sticks in the sink to thaw for change. The sticks will go to a local college basketball game tonight....keeps me out of the candy aisle between games. I need to get working on a batch of these using some of the moose meat I have in my freezer. I was gifted a kit to make these(casings and spices) and a friend has a hand crank sausage stuffer I can use. They are certainly delicious when done right! They're proving to be a challenge to my diet, that's for sure.